At first I was hesitant to read this book because I thought it would be an author just trying to write something that’s already been written. After seeing that Jay Asher, the author of was Thirteen Reasons Why,interested in it I figured that it would be somewhat similar to one of his books. This was true. When I first started reading Before I Fall, it was a little slow but soon realized that it was only the beginning of what was to come next. Halfway through the book, I knew I could not put it down and had to read to the end so I know what was going to happen. I had to know. The author, Lauren Oliver, did a great job at keeping the audience entertained and always wondering what was going to come next. It was not predictable which I loved. When reading this book, there are so many emotions and twists. 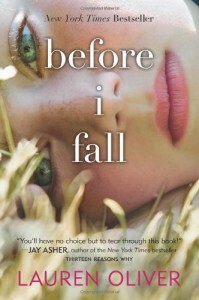 Before I Fall is Lauren Oliver’s first novel and I can tell we can expect much more from her in the coming years.